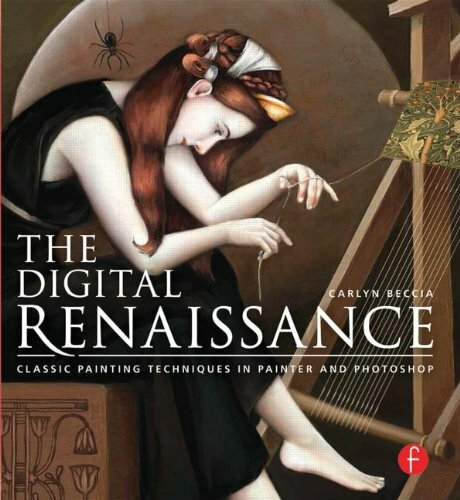 This is a digital painting tutorial book by artist and author Carlyn Beccia. The exact version of Photoshop version used in the book is not mentioned but I'm guessing it's CS5. As for Corel Painter, it's version X3. You should already know the basics on using those software to get the best out of this book. There are 11 old masters included, namely Michelangelo, Raphael, Vincent Van Gogh, Auguste Renoir, John Singer Sargent, Giovanni Boldini, Arthur Rackham, Gustav Klimt, Henri Matisse, Amedeo Modigliani and Pablo Picasso. Each chapter features a single artist with a brief profile and analysis of the techniques used in selected paintings. Those techniques are focus of the tutorials. The tutorials are detailed step by step instructions that are easy to follow along. The author uses those techniques on her own subject matter that's clearly inspired by the old masters. It would be quite stressful to copy the exact old master paintings. Along the way, there are mentions of many traditional techniques, such as creating the colour palette the old masters commonly use, optical mixing as used by Van Gogh, underpainting, the difference between chiaroscuro and tenebrism, and many more. At least you can learn not just the how but also the why. It's a fairly interesting digital painting instructional book. The end results, the effect, look quite good also.